West Africa is well-known throughout the world for its creative music scene. The vibrating, impulsive, but also melancholic sounds created by the mix of traditional tunes from the many cultures of the region and modern ingredients of hip-hop, rap, jazz and many other elements are being enjoyed by more and more people around the globe. The region of Senegal and Gambia – also known as Senegambia due to the common colonial past, but also due to the connection the people of both countries still feel today – is home to an exceptionally vibrant music scene. One of their most influencial genres is kora music. A kora is a 21 string Mandinka harp deeply rooted in West African culture. It‘s built from a large calabash cut in half and covered with cow skin to make a resonator with a long hardwood neck. One of the rising stars in kora music is Dawda Jobarteh from the Gambia. FAIRPLANET had a word with him about his new album and his evolution as a kora player. FAIRPLANET: Dawda, your 3rd album is out now. It‘s called “I met her by the river“. Who was it that you met by the river? Dawda Jobarteh: Imagine sitting by the river enjoying the amazing view, the breeze and the sun. Suddenly a beautiful woman passes by. You catch each other's eyes for a while. The vibe and the image of her stays with you for long. How would you describe your new album compared to the previous ones? It‘s a combination of my own compositions and some traditional West African tunes, and this time also some Scandinavian traditional tunes, since I‘m now living in Denmark. So, that combination is totally different from all the other albums I have done so far. It‘s a little risky I guess, but I wanted to challenge myself in this way. Another difference and a very important point for me is that I now understand my instrument better and I have grown as a musician. That is reflected on the new album. The album is also the product of a process that has been different than the creation of the previous albums. With this album I have been more focused and dertermined on a direction rather than thinking I could do everything at the same time. So, it‘s your first album with Scandinavian influences? Yes. You know, I‘m a kora player now, but I learned to play the kora here in Denmark. Back in the Gambia I used to be a drummer. So, when I moved to Denmark I was 22 years old, and when I learned to play the kora here I was surrounded by all the other musicians here in Denmark, and of course that had quite some influence on me and my music. When you perform on stage, you‘re usually surrounded by other musicians. But you still consider yourself a solo artist. Yes, I perform together with other artists from Denmark or other countries, but I also perform solo. You know, this new album was meant to explore the kora, to see what the kora can give to me and to the audience. But, yes, I do have support from other musicians as well. Recently I‘ve been playing as a duo at a French Cultural institute and some of their alliance partners in Senegal. The duo also had a little tour in Faroe Islands and there’s a tour coming up as a quartet together with a drummer, a bass player, and a percussion player. What musicians were most influencial for you and the evolution of your personal style? 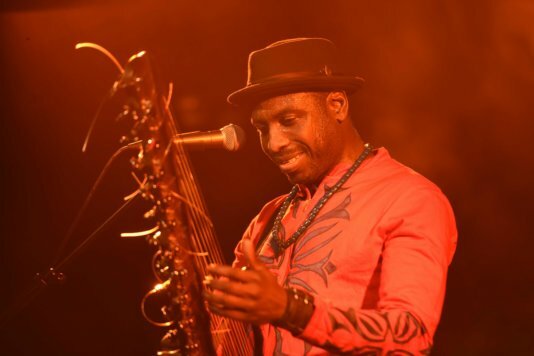 I have been inspired by a lot of musicians throughout my life: Toure Kunda I should mention first, because they brought some new elements to the traditional music I knew at that time, the guitar, the bass, the drums, the horns. They were of course not the first ones, but they were the closest to me, because they were from Senegal, from the Cassamance in the south of Senegal, and a lot of Gambians live there. They sing in my own language, so I got to understand what they say. But also Youssou N'Dour I grew up with, and he, as a Senegalese, was very influential to me, too, with all the percussion and drumming. He was most important when it comes to my drumming side. But there are many others: Salif Keita from Mali of course, but also famous guys like John Coltrane, Bob Marley, Stevie Wonder, Skunk Anansie, Guns 'n Roses – to name just a few, but also Ali Farka Toure, Alhagie Bai Konte, Pink Floyd, Jimmy Hendrix, Bembeya Jazz National, Bill Frisell, Ornette Coleman, Abdullah Ibrahim, Sting, Weather Report, Zavinul Syndicate, Charles Mingus, Baaba Maal, Cheick Lo, and many musicians I play with. You are part of a family of musicians. You are grandson of Alhagi Bai Konte, son of Amadou Bansang Jobarteh, nephew of Malamini Jobarteh and nephew of Dembo Konte. How does your family contribute to your development as a professional musician? In the Gambia, our language called Mandinka is not a written language, it‘s only an oral language. So, our history has been passed on from generation to generation by stories and by songs. In my family, music was all around me since I was born. It is a very strong foundation and I have known that music would be my path of life since the age of 12. The kora is the traditional instrument of my family. I was playing drums, though, until I came to Denmark. But I always played the drums in kora music. In that sense, the kora has always been part of my life. Now I mainly play the kora, but when I play the drums it feels like home. Having the groove inside of me makes me feel that many things are possible. And drumming is my key to learning other instruments including the kora. As a kora player, how would you describe your relationship to the kora? Well, as I said, it means a lot to me. When I was a child, I chose not to play the kora like my cousins. However, because I was very steady when it came to rythm, I had to join my uncle and beat the rythm on his kora while he played it. It was somehow like being part of the instrument, and at the same time being invisible as a person. When I played the percussion, I was free to express myself as a person. After taking up playing the kora in Denmark, I had to learn playing it. It took many years before I could start to relax with the kora. I still don't feel as confident with the kora as I do with the drums, but that state is coming little by little. Now the kora is my steady companion when I explore new land in the music. When I play the drums, I get very happy. But I am a very melancholic person and the kora allows me to express that side of myself in so many ways. When I use sound effects I can express so many different feelings and vibes. Which songs on your new album are most important to you, and why? They are all important to me for their own reason. “Karang Folo“, for example, is a traditional West African tune. It‘s an instrumental song. You can start by playing the bass line. Little by little you can add accompaniment and solo parts, so you end up playing three layers or three musical parts at the same time. “Karang Folo“ means "first lesson“ in Mandinka. So, when you start playing this instrument, “Karang Folo“ might be the first song you learn to play. Beside that, "Jeg Gik Mig Ud En Sommerdag" ("I went out on a summer's day") is one of those songs that I mentioned with that traditional Scandinavian tunes, while "Afro Blue" and "Hello" are respectful nods to Mongo Santamaria and Adele respectively. One of the most powerful songs on your new album is called „Begging Boys“. Could you describe what this song is about? It‘s a song that tries to shed light on the so-called talibés. Basically, these are kids begging on the streets, but the phenomenon when you look at the details, is much more saddening and worrying than you can imagine. In many West African regions, parents are so poor, they are forced to give away their most precious 'possession': their child. In Senegal and in the Gambia, where I come from, we have the same culture, because we used to be one country, and we have talibés here, too. Some parents send their boys to a certain kind of Qur'an school, and it actually is a kind of a boarding school, but it‘s not for free, so they have to beg on the streets for food and money. And if they come back without money, they get punished. Sometimes you have about 200 kids in one compound, and in some places, you find these boys sleeping in the streets at night – hungry, dirty and wearing clothes full of holes. That‘s a very saddening phenomenon indeed. How did you get in touch with these boys? After I‘ve moved to Denmark, I went back to Senegal once, to a city called Saint-Louis, which used to be the capital of Senegal in colonial times. A very beautiful place actually, but when I was there, I suddenly saw these kids everywhere. They were looking dirty and hungry. And once I saw one of these kids outside a club I was playing at 2am, sleeping in the street, and I was heartbroken, and I thought something‘s really wrong with this. I got inspired to write a song about this. I asked a Senegalese icon, Souleymane Faye, to help me to bring my message out. I wanted to question, why and how this is happening, when we can all see that this is not right. What happened after you composed that song? Last year in September I came back there to make a video for this song, and I just went outside the appartment next to them. I spent 10 days with the talibés. I got to know them, I listened to their stories, I followed them to the market. The kids agreed to be filmed by me in their daily activities. I also talked to a lot of grown-ups and they supported my idea to shed light on this issue that is a really big problem. You mentioned that these talibés are taken to Quran schools. So there is a religious aspect to that phenomenon? One could think that it‘s a problem of religious issues, but when you look at it, it‘s more of a business thing. When you have, say, 200 children in a Qur'an school, and everyone has to provide 10 Euros per day, that‘s a lot of money, and those schools are making big money all over Senegal. So therefore there are not so many people who really want to tackle the problem, and there are very powerful people who distract attention away from this phenomenon. It‘s just a big business for them. And it‘s a problem in Senegal, not so much in the Gambia, and especially in Saint-Louis. Are there any attempts from civil society inside the country or from NGOs or other organisations from abroad who try to stop this problem? I don’t know any, but I have heard of a program or some people working to help talibés. I don’t know how organized it is and how many they are able to help. The problem is that you won‘t hear about it, because nobody pays attention. When I stayed with the talibés, I talked to the people on the market, and they said they are even tired of this – but nobody helps them to stop it. I mean, there are kids like 4 years old, bare feet, and everybody agrees that this is wrong, but nobody dares to speak up, because these schools have a lot of power. It is very tough. And you know, I was not raised in my father‘s or my mother‘s house, I was raised in my uncle‘s house, and I kind of know in a smaller scale how it is when there is nobody there to take care of you, you‘re taking care of yourself instead, you take the day as it comes, and sometimes there a lot of challenges, so for me I kind of understand how it is and what you feel in situations like this and not having so much help. You now live in Denmark. How did you come to Europe? And how would you compare life in Denmark to life in Gambia? I was invited to teach drumming in Denmark. The daily life is very different in the two places. People socialize and interact in different ways. In Denmark I live with my wife and three children in an apartment, where the neighbours are not always happy with loud music. In Gambia I was always surrounded by 50-100 family members living in the same or neighbouring compound and peope would play music whenever they wanted. In Gambia I didn't have any privacy with all those people around me. But I am a very private person. In Denmark I choose if I want to have visitors or if I want to be alone. What‘s next? What are your plans for 2019 and beyond? I was just chosen to be part of a project called Danish Vibes. The aim is to be introduced into the German market. So in 2019 I hope to be able to develop my network in Germany with support from the project and hopefully that will lead to concerts around Germany next year. I have not yet played in Germany with my own band. And I am going to have my debut concert as a kora player in Gambia at a big event on the national stadium. It is an event called AfriCourage and is supported and arranged by the Goethe Institut.